I've been listening to scanners since I was a young teen, first at my grandfather's house outside of Philadelphia (which was a lot busier than where I lived) and later at my own home where the scanner is now non-stop police calls 24 hours a day. In High School and for at least 10 years afterward I had a CB as did most of my friends and we used the radio to coordinate to meet up at the parks or out in the woods. 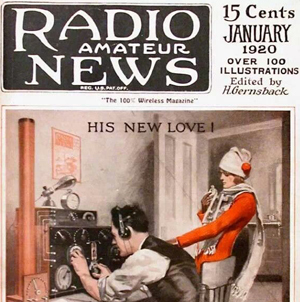 We all had ridiculous handles and our range was terrible even with a sweet K40 antenna none of us ever really bothered to actually learn anything about radio. If we had, we could certainly have made them much more useful. Back when my parents first got their Amateur radio licenses sometime in the late 90s I started studying to get mine as well. CB had become a wasteland and no one I knew was using it anymore anyway. I had taken some classes at the local community college in basic electronics and was already working in the fire industry so radio was definitely interesting to me but for some reason I just never scheduled myself to take the test and eventually lost interest. Recently I decided to pursue it again, and now with the internet the resources are just everywhere. There really is no excuse to not learn as much as you want about anything. Hams with YouTube channels will mentor you for free and there are web sites which offer free study and practice exams you can do right in the browser with instant feedback. Beyond the interest that I have in scanning and radio in general, I'm also curious about some of the possibilities in digital radio networking. While a lot of older Amateurs seem to have gotten into the hobby mainly for voice communications, contesting (how many contacts can you make and how far away), and emergency preparedness (radio can still function even in a grid down situation), a lot of younger Amateurs (and this includes anyone who grew up in the early days of computing and BBS) seem to have an additional interest in radio for purposes of networking for multiple media types. 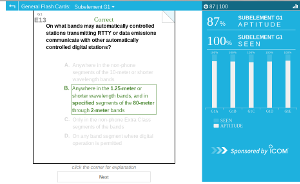 To prepare for the exam I used hamstudy.org which is provided by IComm (a radio manufacturer). The site is nice because you can authenticate with Google without having to set up yet another account and its interface was slick and easy to use and understand. It keeps track of which questions you've seen and the percentage of those you've gotten correct. You can review the questions by section and take practice exams. It worked so well that I passed for Technician within about a week of study. The math was really just a few simple formulas (V=IR, P=EI, and a rule of thumb: 300/Freq in MHz = wavelength in meters), the rest is really just memorization. The General exam had a lot more information to become familiar with, but I managed to prepare for that over a couple weeks and passed on Apr 28, 2018. I've already started studying for the Amateur Extra exam! DX Maps - a tool for mapping contacts you make. Amateur Auxilliary is a group which performs self policing activities including direction finding (triangulating) and reporting non-compliant transmitters. RTTY is a very old digital mode. RTTY started out as teletype. Still being used for maritime weather alerts. PSK31 is supposed to be the most popular. Have some built in noise correction which allows it to work over worse noise than RTTY. PACTOR radio modulation mode for digital information on HF - from a German company, only PACTOR I is open, other modes are proprietary and encrypted requiring a PACTOR-made modem. JT - a software used for weak signal communications. FT-8 - article about the great new shiny digital mode which is luring folks away from JT? D-Star - I'm not quite where to file this link. Great article discussing D-Star, a digital standard which links repeaters over the globe and can do 128Kbps (enough to load webpages) in DD mode and provides digital voice (DV) communication (with simultaneous slow mode digital data). Less noise than FM. no antenna? use a DV dongle to connect to the network over your internet connection. Log4OM was suggested in one of W6LG's videos, but that is for Windows only. However, understanding what this software can do should inform as I look for something that runs on a decent OS. APRS Messenger - written for Windows but a post in Apr 2018 CrossCountryWireless claims it is working in Ubuntu under wine. Great little utility to send and receive digital text over APRS. What's needed for a complete system? Linear Amplifier - not required to start out, but once I have a General license I'll have the right to transmit with a lot more power so it might be something I'd want to do someday. Microphone - keep it under $100. Shure 444, Heil HC55. Can I use any of my mics? Shure SM7B ($350) 160 Ohms is 1/4 the typical Ham mic. Why not an SM58? Shack Furniture a friend suggested that I be careful to not leave this off the list. For a good experience, remember to budget for a good chair and desk dedicated to the hobby. Antenna Tuner - most people say you will use this all the time where you only use an analyzer when you've made a new antenna. It seems like you should be able to to get one of these with an SWR meter in it? Field strength meter and calibrated antenna - for indoor antennas one of the questions on the General exam says: "You should use testing equipment (calibrated field-strength meter and calibrated antenna) to make sure that the maximum permissible exposure (MPE) limits are not exceeded." Antenna Analyzer - in many cases better than an SWR meter and doesn't require an external RF source. Cross band repeat - if I get a mobile or base station with this, I'll be able to use an HT to talk "through" it (this might be handy for hanging outside with an HT but having the power of the mobile / base station. This is an added complication in setup which might not be worth the extra effort. I really need to evaluate how I want to operate. Remote mountable faceplate - this might be useful in a vehicle so you can mount the radio portion somewhere and run the faceplate up to the dashboard for operation. Or, it might even be useful if using the mobile unit as a base station to have the controls nearer to hand and have the radio on a shelf. D-Star or DMR - competing digital modes. Have to evaluate, but suffers the same problems digital TV does as it is an all or nothing transmission. At least you won't be hearing a lot of static. Settle on Bands - so far with my HT I've only operated on 2 meter and 70 cm and mostly 2 meter. At least near me 2 meter seems most common. I've heard some New Englanders say that HF is more popular up there which makes sense since folks are farther apart and there are hills and such. While I consider my options for a good base station, part of my plan is to have an HT (handi-talkie) which can be used to communicate while on the road or camping. Low horizontal antennas, such as dipoles between 1/8 and 1/4 wavelength above the ground work best for daytime skip communications on low frequencies. Copper pipe DIY J-pole antenna - I wouldn't personally mount it on the back of the car as shown here, but for a sort of stealth install this could be good. Most folks stress how important it is that the antenna be solidly grounded - good grounding straps to the frame if you're mounted on a trunk lid for example. The idea of "grounding" something to a vehicle is funny to me given that the whole thing is insulated from the actual ground by big rubber tires. Ham Stick - bottom loaded inductor with standard whip. "Hamstick" was a trade name of Lakeview Co. and their products were reported to be very good. Their domain, hamstick.com, is not working as of May, 2018. Hamstick has become a sort of generic term for anything like the original Lakeview Ham Stick. MFJ now makes a "Hamstick style" antenna and there are mixed reviews. I do like the mounting and how easy it is to switch them out for various bands. Some folks use them in a dipole configuration, but most agree that while performance is acceptable for 10 to 20 meters, on 40 to 80 meters Hamstick style dipole performance is atrocious. Diamond M285 - mobile 2 meter, single band antenna with NMO mounting. Browning BR-180 was highly rated by folks on eHam. I think I like the NMO mounting method more than the UHF type, and I've read that its easy to convert from NMO to UHF but not the other way around. That leads to the next investigation, what is the best way to mount it on the vehicle. When you get your Amateur license you are assigned a call sign from the next available call sign by the FCC. This might not be a desirable call sign to you, but you are allowed to request a "vanity" call sign. Since you're going to end up using the sign alot this is definitely something I'm interested in. I'd love it to match my domain name, but N8WRL is already taken. I started a list of signs I might want and ended up finding a bunch of joke signs which I neither want nor probably could get. Not sure what I'll do yet, I might just keep whatever I'm assigned. After getting a horrible FCC auto-issued call sign I started to research "vanity" call signs which I'd be happier using. I was surprised that most of the signs I came up with were actually already in use. I've left off a bunch of joke signs like K9SEX which, while hilarious, would probably eventually embarrass me. It took exactly 18 days for it to come through, but I'm much happier now. The call sign of the repeater is either the call sign of the owner or the call sign of the club that owns / operates the repeater. When programming a repeater into the radio, you need to enter not only the frequency, but usually a tone frequency to which the repeater will respond. Motorola Quantar - nice write up for identifying models of Motorola repeater. These repeaters were designed for public safety use and would make excellent Ham repeaters if you can find one in the desired band.